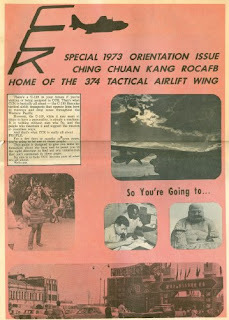 I don't usually post things from down-island, but I came across an on-line copy of the 1973 edition of the Ching Chuan Kang (CCK) Republic of China Air Force Base orientation booklet. It has a section about the US Taiwan Defense Command and Taipei, which I thought some of you might find it interesting. There's a section about housing and the cost of staying in the hostel at CCK. I don't recall what I paid at my hostel next to the East Compound in Taipei but the CCK hostel rates seem very reasonable, even for those days. All I remember is that my room was less expensive overall than renting an apartment elsewhere in the city, especially since I had no utilities to pay or transportation costs to get back and forth to work. You can find the complete CCK brochure HERE. You posted a link to this publication in February last year. It's good info though; on how it was back then.